I always have the creeping suspicion when the plane is taxiing that while it is turning, the front wheel is going to snap off and the whole aircraft falls forward into the tarmac. So they ask me to come to another attendant, and fearing the worst, the attendant hands me a boarding pass and says “Congratulations you have been upgraded to business class.” I couldn’t believe my ears! I was giddy with excitement as I walked down the tunnel towards the plane. The greeters say how my seat is straight ahead and to the right. So I am walking down the aisle past some posh first class seats and walked through a curtain into the next section. I remembered then to look at my actual seat number since it has changed from before. I look down, see 24G, look up and see 28K in the first row of the section I am standing in. Meaning, that that posh section I had just walked through was actually my section! How life is good! I got a seat that had its own (roughly) 20” TV that could fully recline with lots of storage and its own noise canceling headphones. Things started off with a hot towel and a glass (yes glass and not plastic) of water. Once everyone was seated we received a bottle of water and a toiletries bag containing lotions, chap stick, socks, a shoe horn, toothbrush and paste, and an eye cover. After takeoff we were served a meal. My food and drink consisted of Appetizer: red wine, shrimp salad with cocktail sauce, with a salad and rolls; Dinner: More red wine, chicken breast with green beans and cornbread (one of the many options that I chose); Post dinner: Port wine with cheese, fruit, jam and crackers; Dessert: Caramel flan cheesecake and coffee with gourmet chocolates. All of this was consumed while lounging in my chair and watching Lincoln and Killing Them Softly (terrible movie by the way). I proceeded to try to sleep, but was only able to get about a half hour of sleep at the most. After my failed attempt at sleep I watched an episode of Anthony Bourdain: No Reservations and moved into the movie, The Master. I had seen a trailer for this movie before it came out and thought that it looked good, but it got very little publicity so when it did come out I totally forgot about it. So I gave it a try. What a waste of 2 hours and 15 minutes. The whole thing made very little sense and really did not have much meaning (however I am a poor excuse of a movie critic). Once this movie was over I looked at the clock. I wish I hadn’t. Still seven and a half hours to go. And I’m getting very hungry. After waiting another 5 hours occupied with more movie watching, we were served our “breakfast.” Mushrooms, mushrooms, and more mushrooms. Oh yea, and fruit. Two of my favorite things… I scarfed down the rolls and crackers, leaving the food that my food eats alone. Going to have to feast after landing. 1:38 to go. Of course as soon as the plane makes its approach for landing and turned on the fasten seatbelt signal, I get a strong urge to use the bathroom. So that final half hour in the air was excruciatingly long. After we get off at the gate and I relieve myself, I realize that if I had not been upgraded, that flight could have been much, much worse. I decided then to give myself a mental note to give Cathay Pacific a great review. Now getting from my plane to Hong Kong Island was a breeze. Getting from the MTR to my hotel was not. Immigration had a massive line, but the attendants kept it moving fast. After that I headed to baggage claim, and spotted my bag right away. Next stop, ATM to get some $HK. Buying a ticket for the Airport Express was a cinch as well. Now Chicago and London need to take a page out the Hong Kong MTR System for their subway systems. The Airport Express is a part of this system. The tickets are pretty cheap. The stations are large, spacious, and clean and include a board at each stop telling you how long until the train arrives. The stations can be crowded but it never seems overwhelming. The trains are long and the cars are large and sterile with lots of handholds, although since the ride is so smooth, they are almost unnecessary. The railways are enclosed so there is not much danger. The Airport Express has a route map lit up by LEDs so you can see where you are. From the Airport to Hong Kong Island at the Central Station takes about 30 minutes. The regular MTR stops have maps lit up with LED lights as well, telling you what line and stop you are on and headed to. There are also arrows showing which direction you are headed. However, as soon as you step out of the clandestine buildings of the MTR, you step into the chaos that is Hong Kong. Streets are narrow, signs are in Chinese, lots of people everywhere, small indistinguishable street signs (if existent), and tall buildings. Its a bit overwhelming at first, coming from Suburbia, IL. I pull out my map and start walking in what I believe is the right direction. I come to an unscheduled fork in the road… Uh oh.. Decision time. I took the road less traveled (ha ha). I end up totally lost in a foreign city at night. Not a good situation. It struck me then that it was about 40-50 degrees hotter here than in Chicago, and I’m wearing a fleece and jeans with a backpack and a duffel bag, and I’m starting to sweat profusely. Things are not looking good. Now I’ve seen pictures of the hotel online before I left, and its a 25 story blue building. So I after a few more ill advised random turns, I come across a street that I actually recognize off of my map. I know have some sort of bearing of where I am: about 6 blocks past where I needed to go. Finally I arrive, exhausted and sweaty, ready to begin my time in Hong Kong. 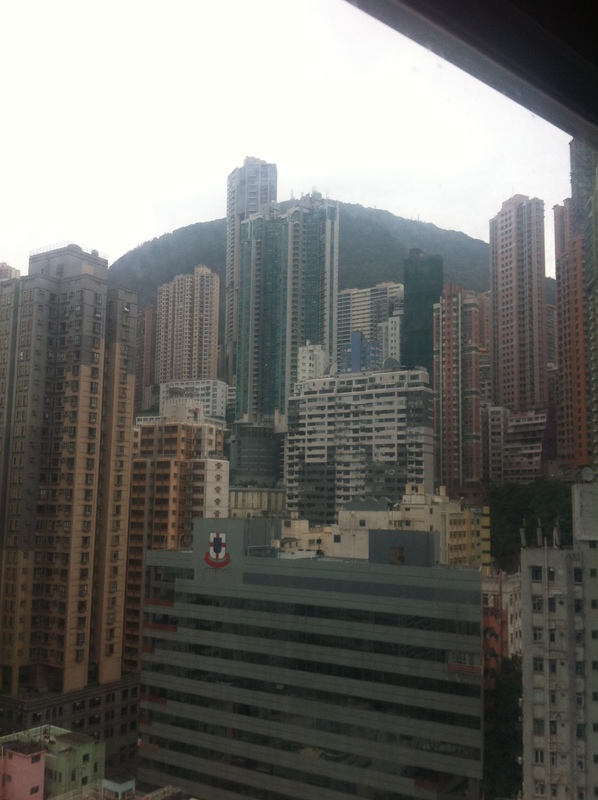 This entry was posted in Hong Kong, Travel, Uncategorized and tagged Cathay Pacific, Hong Kong, MTR, Trans-Pacific Flight, Travel on February 20, 2013 by hanlont.